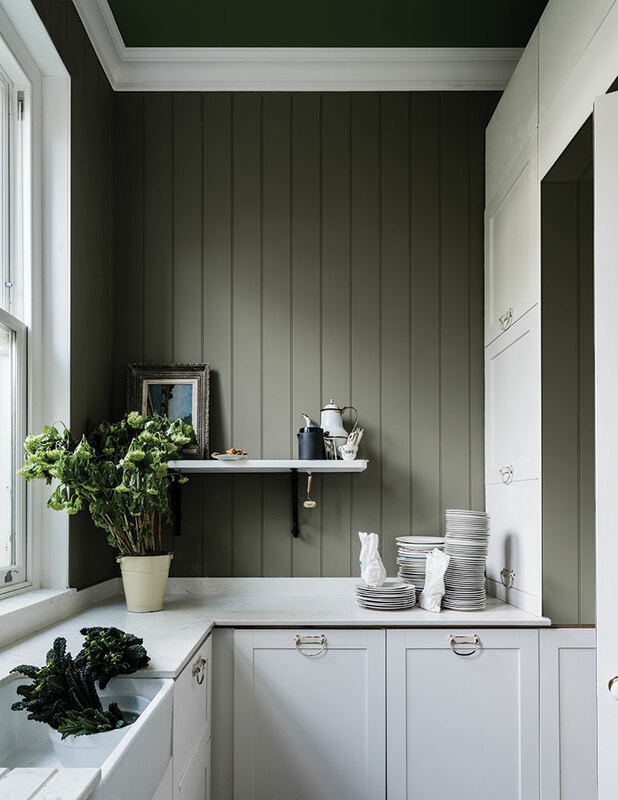 Farrow & Ball just released nine new paint colors, and we are absolutely in love. So today, we’re taking you on a tour of each shade to give you an idea of which color works best in each room. And trust us when we say that you’ll want to paint every inch of your home in these colors – they’re simply gorgeous. The kitchen and dining room are spaces of gathering. They’re the essences of a home – where people eat, have meaningful discussions, and connect on a deeper level. So it’s no wonder why our favorite hues for these spaces are De Nimes, a timeless and stately blue, and Treron, a natural and soft green. Both bring a sense of serenity combined with richness to create an atmosphere that’s perfect for a group toast. While the kitchen and dining room are spaces for activity and ongoing interaction, the living room is all about enjoyment and introspection. It’s a space for a variety of interests – from entertaining guests to reading a favorite novel – so it deserves a color that evokes those feelings of coziness and warmth. We recommend either Preference Red (a deep and bold hue), Bancha (a dark and vibrant olive), or Jitney (a muted and soft taupe). Whether you want to make a statement or opt for a more traditional vibe, you can’t go wrong with these colors. Rest and relaxation are key elements in a bedroom, so it’s ideal to opt for a color that is calming. Both Jitney and Sulking Room Pink are perfect options, and while Jitney is more of a neutral brown-based tone and Sulking Room Pink gives a subtle pop of color, they both add a softness to the space that is essential for recouping after a long day. Our workspaces should spark creativity and thought, which means that the right color can go a long way towards making a space feel inspiring. The first, Rangwali, is a bright pink that brings about energy and vitality – it’s perfect for the individual who loves to think outside the box and experiment with new ideas. The second, School House White, is a soft and creamy white that helps to bring tranquility to an office – this shade is a great fit for the individual who prefers clean lines, balance, and organization. Finally, because the bathroom is often one of the smaller rooms in a home, it’s a wonderful space to experiment with color to add personality. 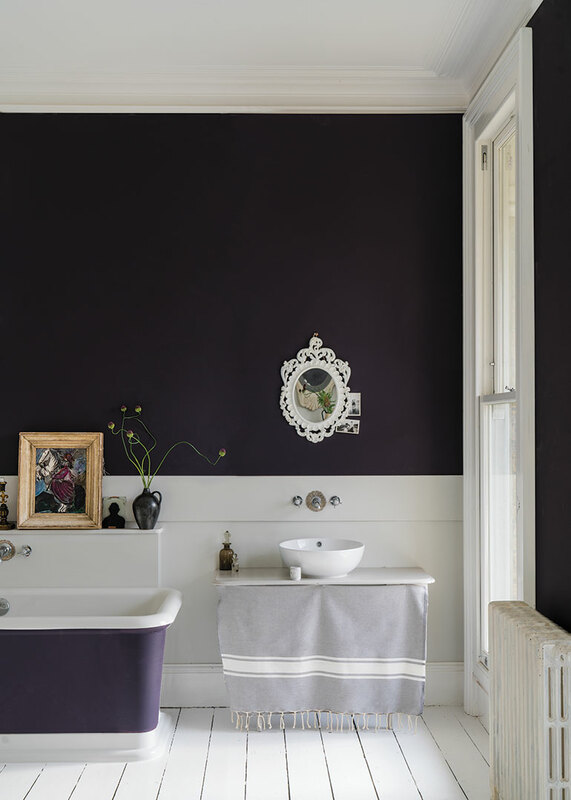 We love the idea of incorporating Paean Black, a rich black hue with purple tones that adds a sense of luxury to a space. Or if you’d like to stay within a more traditional color scheme, we recommend De Nimes – its blue is classic and grounded, evoking clarity and peace of mind. There’s no doubt that color can transform a space instantly. It shapes our environments and is a crucial aspect of how we feel. 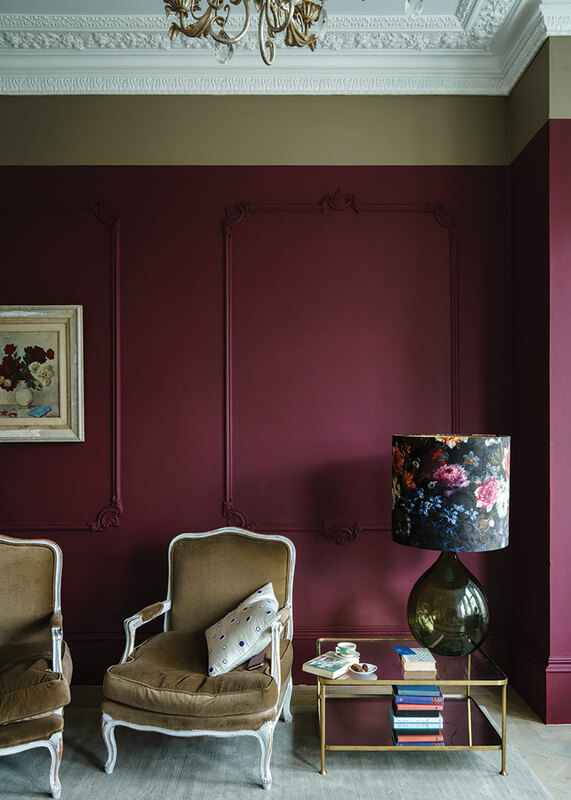 So, as you admire Farrow & Ball’s beautiful new collection this fall and contemplate a paint refresh, remember to pause and think about the feelings you want each room to evoke. If you put your lifestyle needs first, it’s sure to be a perfect match.